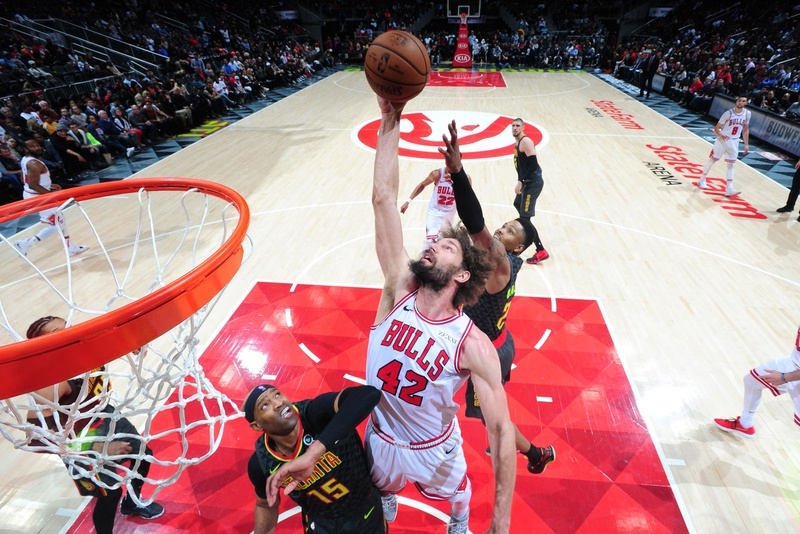 Robin Lopez is by far the oldest player on the Bulls roster, about to count to 31 on aptly, April Fool's Day. The rumbling seven footer has been referred to, at times by the modern sages of the game, as a dinosaur. Though he's not quite that old. Even if some T-Rexes were said to have similar hairstyles. But since the kids, alternately, have often been running out of energy and have taken some days to recover in repose, it's been Lopez always there, always ready, always reliable and continuing to be more productive than he ever has been. 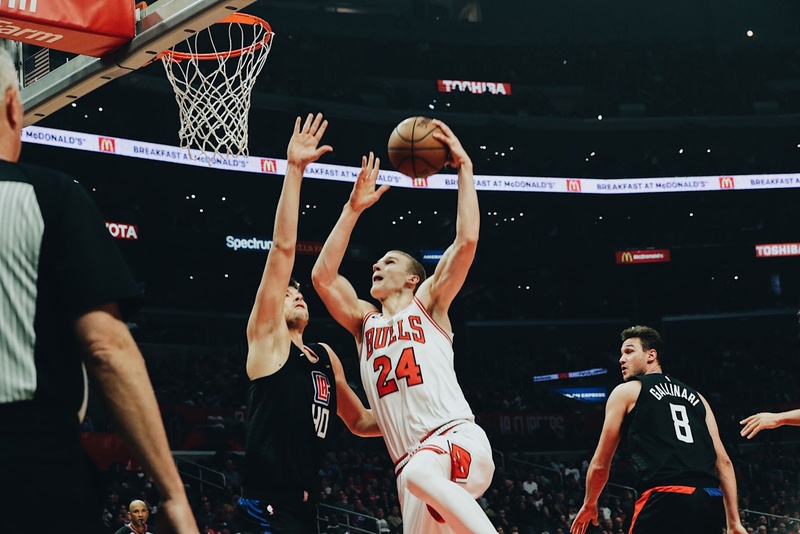 Since something of a late season detour with the four-overtime victory over Atlanta, Lauri Markkanen is going through one of his poorest stretches as a Bull. Zach LaVine just returned from two games off to rest his knee to score 31 points in Friday's loss to the Los Angeles Clippers. Otto Porter Jr. got a maintenance day immediately afterward. Kris Dunn saw his minutes held below 30 in five of the next seven games. "I think that game affected our whole team," admitted Bulls coach Jim Boylen. "I also think we exhaled a little bit. Atlanta was a good feeling. We won, great game. Philadelphia was a big win. But you have to keep grinding in this league." When you have a veteran guy who never wants to sit out or skip practice, there's a lot of power in that. In yet another of those unlikely scenarios in this developmental season, the play of the senior member of the team has been as inspiring as any. 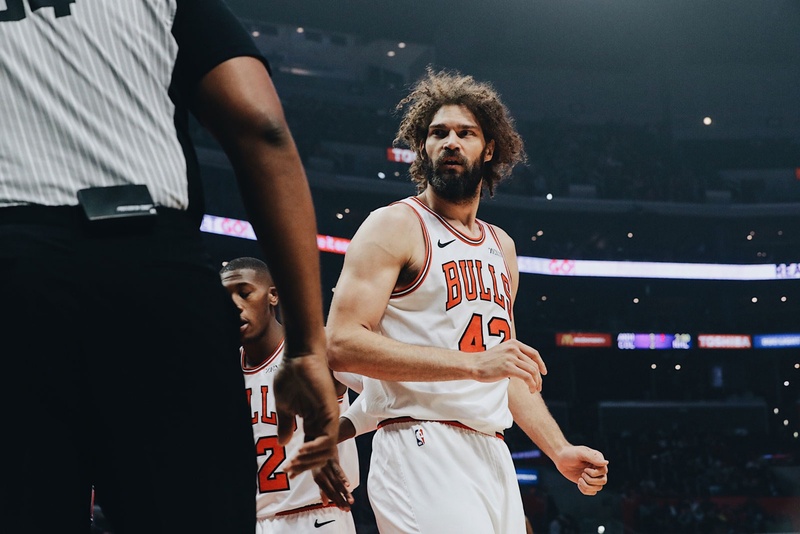 And it continues as Lopez has been the unwavering iron man in this latest stretch since the overtime marathon, averaging 33 minutes per game with 17 points and 7.1 rebounds, shooting 61 percent and Friday with a 16-point first half that Boylen called dominant. "His teammates know he's for the team, so he's been an example of what a veteran leader looks like for this group," Boylen said Saturday after practice in Los Angeles. "The way I look at life and the game is it comes back to you when you do the right things. He's been very selfless, he's practiced very hard. He never misses a day. He's one of our better practice players. He's got great maturity and I feel like he's kind of a big cog in our offense right now, the best screener, the best pocket guy, an offensive rebounder. He's in great shape, takes great care of himself, eats well. His body looks the same as when he was 25. When you have a veteran guy who never wants to sit out or skip practice, there's a lot of power in that." It hasn't gone so well elsewhere around with the Bulls having lost six of their last seven games since that overtime classic heading into Sunday's 5 p.m. (Central) start in Sacramento. LaVine and Porter with some rest have stayed around their season averages, so perhaps Markkanen could use one of those load management moments since his load seems to be somewhat unmanageable lately. The talented sophomore after ranking among the most productive players in the NBA in February is having his poorest stretch of the season. Only once last season did he go longer without having a 20-point scoring game, Markkanen averaging 14.3 points and 7.9 rebounds on 26 percent three-point shooting since that win in Atlanta. He was averaging 19.7 points and 9.3 rebounds, according to basketball-reference.com, for the season until then. Markkanen had 10 points in Friday's loss, his fewest since January 11, though he's shown no change in attitude or enthusiasm. He's been open and light hearted with media, again accommodating additional international media in Los Angeles. He's continued to remain positive and says he knows his shot will return, that he'll keep working at it and hasn't lost any confidence. "When you miss the first two months of the season (with the right elbow injury) your foundation is not the same," said Boylen. "You're out of shape and then you play at such a high level. In February, he was a top 10 player in the league. But he's still been coming early and staying late, working at it. He knows he's in a place where he's not playing as well as he can to help the team. That bothers him more than anything. He'd like to play better." Meanwhile, the renaissance continues unabated for Lopez, who continues to reinvent himself to the surprise and delight of the Bulls. Last season and into this season regelated to also ran status, Lopez has been perhaps the team's most reliable player recently. He's even increased his scoring while the fatigue of the Atlanta game seems to have impacted others, the player once known only for defense scoring at least 20 points in three of his last six games and at least 19 points in half the games this month. Despite the latest conventional wisdom that a physical, defensive oriented player without shooting range no longer has a place in the NBA, Lopez is even filling up the analytics scoring boxes. "Who doesn't love scoring the basketball?" he smiled as he fiddled with his phone after practice. "That's kind of the name of the game. I appreciate it. I think more so I enjoy growing my game. What's fun for me is in different seasons I've kind of been able to do different things. When I first came here playing with Jimmy (Butler), D-Wade and Rajon (Rondo), I was shooting a lot from the mid range. That wasn't new for me, but that was the first time I kind of shot heavily from mid range. I enjoy kind of exploring my game that way. I've always thought I'm a lot more versatile than I've shown the floor. I kind of do what is needed from me. "Obviously the NBA emphasis is on three pointers or getting rim twos," Lopez said. "I'm trying to capitalize on taking high percentage shots and hopefully making them at a high clip." That's right. Brother Brook is shooting those threes, and the formulas say get the threes, free throws or layups. Robin makes more than 60 percent of his inside shots, so he's not diverging from the welcomed formula. All the while showing with that nearly unstoppable drop step, post spin move that there's more there, as there always has been, than meets the eye. Raised as a defensive counterweight to his seven-foot twin, Robin always was satisfied to be the gear to make the wheel work no matter what was needed. Finding out where it works for me, making sure I took my time exploiting whatever matchup I had. Kind of what happens when you get in the league, you have to evolve your game. In his first four seasons in the NBA, Robin averaged about seven points per game and merely five field goal attempts. Robin says it actually was when he went to New York in 2015 with Phil Jackson and the triangle offense that he got the chance to expand his offensive side. "I loved playing in the triangle," Robin said. "That was a fun experience for me. You get to play through the big man a little bit; you get to make decisions, which was a new experience for me. I think it helped me grow as a player. It had been a long time since I had been kind of the crux of an offense like that. Actually almost never thanks to (brother) Brook and Quincy (Pondexter). "But that was a lot of fun," said Robin. "You get to be a decision maker and grow your basketball IQ that way. In New York, I was playing with other veteran players like ‘Melo (Anthony), Jose Calderon, really smart and savvy players and they helped me. And obviously Derek (Fisher, coach), Kurt (Rambis, assistant) Phil, the staff there. That really was the first time in the NBA where I looked to kind of refine or revive my post up game from back in college or high school. Finding out where it works for me, making sure I took my time exploiting whatever matchup I had. Kind of what happens when you get in the league, you have to evolve your game. "Now, I'm playing with a lot of really skilled offensive players, OP, Zach, Lauri; KD is a great point guard facilitating, finding others. They all allow me to play to my strengths," Robin says. "When you have a lot of guys who can space the floor like that and find you in advantageous positions, personally it really helps a lot. I appreciate them looking for me." Because a player like Robin Lopez always is looking out for them. It continues to make for some intriguing possibilities.